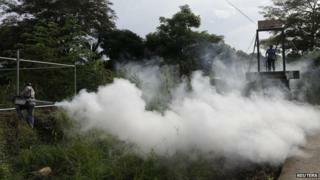 Colombia's health ministry has confirmed the first four cases of chikungunya virus in the country. All four are thought to have contracted the mosquito-borne virus locally. Tens of thousands of people have been infected in other Caribbean countries since the outbreak in the Americas began in December. There is currently no vaccine or treatment for the mosquito-born virus, which resembles dengue fever and can cause fever, skin rash and joint pain. Far from its usual home of Africa and Asia, it is the first time it has spread locally in the Americas. "Based on what has happened in other countries, chikungunya could infect about 670,000 people in Colombia in the next few months," said Deputy Health Minister Fernando Ruiz. Those most at risk were people living at altitudes of no more than 2,200m (7,200ft) above sea level, where the climate is warmer, Mr Ruiz said.